When I first heard of Lindsay Lou & the Flatbellys, my first reaction was: who? I’ve heard of a lot of stringbands over time, and a roots ensemble from Michigan was not on my radar. But as a volunteer at Mansfield’s Rose Garden Coffeehouse for some 25 years, I’ve come to expect the unexpected. It was only a few years ago that the coffeehouse’s artistic director, Mac McLanahan, introduced me to the music of the Steel Wheels — another stringband I had never heard of. I gave them a chance and now have come to love that band, and I’ve seen them perform multiple times. With that in mind, I started listening to Lindsay Lou and the Flatbellys — and I’ve not been disappointed. 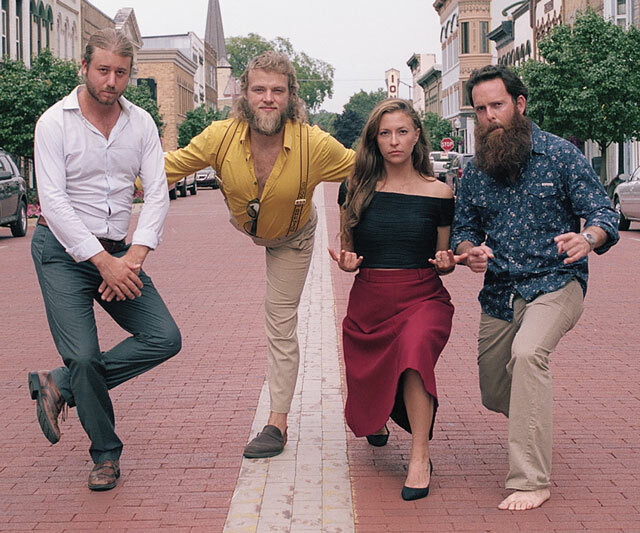 Lindsay Lou and her band will perform this Saturday at 8 p.m. in the Rose Garden, now in its 26th season and one of the premier coffeehouses in the state. 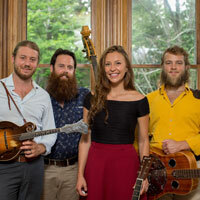 This remarkably fun, young roots ensemble has a snappy sound, tight harmonies as the perform folk, pop, Americana, bluegrass and original songs. Lindsay Lou’s sweet, powerful vocals, tinged with blues and jazzy undertones, leave a lasting impression. You just have to hear this band to appreciate that they will be going places. “Lindsay really puts her heart into what she sings, and how! … Phrasing, tone, emotion, it’s all there. Effortless seemingly. Simply mesmerizing,” says David Grier, three-time International Bluegrass Music Association guitar player of the year. On the band’s newest album, “Ionia,” the band rests on the cusp of change, poised at that moment where everything shifts into high gear and time rushes forward. They bring a musical tension to the stage and to their album, knowing when to let loose and when to hold back. You can hear this tension musically on their new album, especially on the leading song “Hot Hands,” with its playful rapid-fire picking, stop-and-go bass lines, and steamy vocals. In true stringband fashion, the album was recorded in Michigan over four days, circled around one microphone, allowing the band to blend vocals and instruments organically. The band is on top of its game, and the Rose Garden is fortunate to have nabbed this band on the rise. 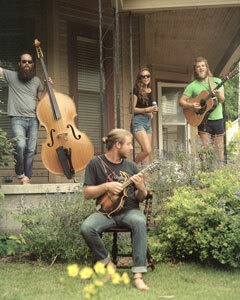 Performing live, the Flatbellys delight in swapping instruments back and forth. They bring a great sense of play and warmth to all of their music. That is displayed in some of their newest songs, from the fantastically sarcastic “Criminal Style” to the lovely housewarming “House Together,” no doubt brought about by long car rides and a strong camaraderie. Much of their musical power and energy comes from the impressive mastery each band member shows on their instruments. Mandolinist Joshua Rilko picks with a careful precision, surprising when he slams into speedy power chords. Dobro player Mark Lavengood is deft at matching melody lines with quick responses. Bassist PJ George creates bass lines cleverly crafted to uphold the song structures. Leading the group, Lindsay Lou has the kind of voice you can get lost in. One part jazz singer – effortlessly transitioning octaves – one part blues shouter soaring over the band like a clarion call, and one part folk singer, rousing them all together in song. Doors open at 7:30 p.m. Tickets are available online or at the door for $16. The non-profit Rose Garden Coffeehouse is held in The Congregational Church of Mansfield, 17 West Street, Mansfield. It is wheelchair accessible and alcohol-free.